Japan had the fifth largest tank force in the world when the Second World War began. I know of only a few other injection molded 1/35 set of Japanese tankers. Happily MiniArt fortifies this subject with this impressive quintet. MiniArt’s set of five Imperial Japanese tankers is presumed to be engineered to fit in and on the Dragon 1/35 Type 95 Ha-Go. The models are packed in a plastic bag contained in an end-opening box with a small sheet identifying the parts on their sprues. Very good artwork representing the figures comprises the box art. Those same images are also the only assembly and painting references provided. The parts are not numbered on the sprue so if that little sheet of paper is missing then you will have to rely on your common sense. Fortunately the parts for each figure are all molded together on the sprues. The five tankers, a tank officer (Sensha-Shōkō) and four-man tank crew (Sensha-Tōjōsha), are built with 57 gray styrene parts. The pieces are molded to a high standard with definite recessed and relief detail. Molding is generally crisp although some of the smaller detailing, such as belt buckles, are “softer” than most resin figures I have experience with. There are no visible ejector marks, sink holes or flash, although most parts have definite seam lines. A couple seam lines on necks are almost significant enough to be flash. Fortunately, MiniArt molds fit together well enough that none of the parts are misaligned. Unfortunately, cleaning up the seams is difficult to do without damaging detail. Each of the five basic figures is assembled with seven parts: separate legs, torso, two arms, head, and headcover. Facial detail is very good with different expressions. And a couple of mustaches! I don’t think they all look Asian. All five are supplied with a holster for a Type 94 pistol and a Type 99 ammo pouch. Four Type 30 bayonets in scabbards are also included, plus eye goggles. The officer’s kit includes a map case, binocular case, and his sword. These parts have good molding and detail. All five figures wear summer uniforms and fatigue gloves (Gun-te.) 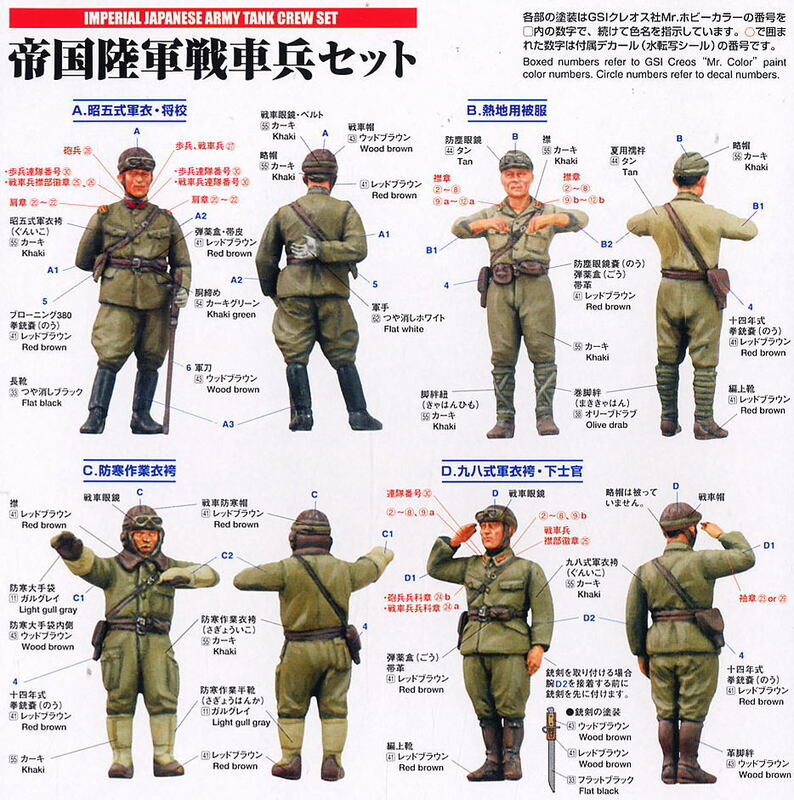 Four of these Sensha-Tōjōsha wear summer crash-helmets, while one wears a field cap with a neck sun curtain. Shōkō wears the Model 98 summer uniform with box pleat pockets, with his undershirt collar worn outside the tunic, covering the lapel. Three Sensha-Tōjōsha wear the one-piece summer overall. These baggie uniforms are cast with deep folds, shallow recessed pockets and shoe detail, and raised fittings where appropriate. The sitting private (-Hei) wears a tropical shirt ( Bousyo-jyu-han) and Model 98 half-breeches (98 Shiki-Gun-ko.). These are molded with the same detail as the overalls. All except the Shōkō wear puttees (Kya-han) and Showa Type 5 boots (Sho- 5 Shiki Hen-jyou-ka); he wears high leather boots. None of the puttees are molded with the crossed tapes often seen on Japanese troops. All wear two waist belts plus a “Sam Brown” shoulder belt that supports the pistol holster. The officer is molded with two additional straps for a map case and binocular box. Buckles, holes, loops and frog tabs are shallowly molded to detail the straps and belts. This makes them appear "soft"; however, my references show these leather belts with many leather straps and loops so perhaps it is authentic in this scale. Buckles and tabs on the helmet chin straps are almost unnoticeable. Photos of the assembled models on MiniArt's site show much sharper definition than on my figures; however, the photos also show a lot of debris that I'll bet is left over from MiniArt's modeler drilling and carving the figures for better definition. Japanese pistols often were suspended outside the holster with a cord looped around the torso and this detail is molded onto three figures. One figure is wrapped in a Buun-Tchokyu, a patriotic good-luck flag. The field cap and the neck curtain are molded as individual parts, as are all five goggles. Equipment sports good detail including stitching or fittings on the map case. Holsters and cartridge boxes have reasonable detail. Shōkō’s sword is impressive! Not only is it molded with strap and buckle detail, it also features a fist-strap, tassel, and grip patterns. None except for what is shown on the back of the box. Your ingenuity is required to figure out where to mount some items because the illustrations only repeat the box art view. Though Japanese uniform colors varied wildly, the summer uniform was intended to be Tsuchi kusa iro, a drab brown with a slight yellow-green hue. MiniArt simplifies this as ”Khaki”. Only four other colors are listed: black, flesh, red brown, and white. Paint brands referenced are Humbrol, Life Color, Mr. Color, Revell, Tamiya, Testor, and Vallejo. However, nothing except basic guidance is provided for uniform and equipment colors. Fit was good. Some gap filler was used between some legs, arms and shoulders, and along the waists. Slight depressions were molded into hips to accept the bayonets. However, holsters and ammo boxes are not contoured or inset to a particular figure. This makes some set unnaturally against the uniforms. First I primed the figures with a tan satin. I nipped the parts from their sprue attachments, cleaned off any burrs, and joined parts with BSI Cyanoacrylates. To facilitate painting I did not always join the legs together before painting; many components were painted before. My references convinced me to paint the crew uniforms “khaki.” I used the late-great Pactra Acrylic Enamel color A24 Flat Brown Drab for the Sensha-Tōjōsha uniforms. I washed it on which simulates the mustardy “khaki.” A variety of Life Color, Pactra, Polly Scale, and Vallejo acrylics were brushed and washed onto the figures. After the parts were joined I did what touch-up was needed, added some shadow around straps, and weathered the leather items. All straps and belts were painted as early equipment except for one figure; his crossbelt was painted with a length of olive webbing, dating the figure to after 1943. As no rank or insignia patches were molded I ignored them except for one figure. I painted the sword fist-strap blue and brown as for a company grade officer. After all paint dried, I shot each figure with a matte clear. After it dried I weakly tinted Future with brown and “glassed up” the goggle lenses. Assembly with CA was quick. I decided not to clean up most mold seams nor fill seams because I want you to see for yourself what the kit is like built mainly out-of-box. The figures balance well but the bottoms of the shoes need to be flattened. One problem that showed up at this stage is that holsters and ammo boxes were tooled to attach to the sprue by the visible top surfaces. Even nipping the parts off left slight burrs to be cleaned and repainted. Another problem was attaching the neck curtain to the tanker wearing the field cap. His ears are too big and the curtain would not fit around them to attach to the cap. Unfortunately I first decided to nip off the front edges of the curtain instead of the ears; the curtain still did not fit so off came the ears. Now the curtain fit to the cap except for two notches near the temples. I filled these in with white glue. I posed the figures with my only built 1/35 IJA tank, the Tamiya Type 97 Chi-Ha I built over 30 years ago. I think that these figures built up into good looking models. They have impressive detail. Poses look natural and relaxed. The molded detail is very good. I am impressed with the molded recesses for the bayonets. Those same molded recesses for the bayonets make the lack of indention for other equipment items all the more disappointing. I am troubled by the mold seams and minor flash. I am also disappointed with the lack of painting and assembly instructions. I think these figures build up into good looking models and I had fun assembling them. It took longer than expected, about 10 hours! Some of that was me examining the models, references, and pondering how to paint and glue with the least trouble. I am happy with these fine models and I do recommend this set for any fan of Imperial Japanese armor. Please remember to tell vendors and retailers that you saw this model set here - on Armorama! 1. A Dictionary of Military Terms: English-Japanese--Japanese-English. 2. Akira Takizawa. Taki's Imperial Japanese Army. 3. Daisan Shoutai/IJA3PLT.COM. Imperial Japanese Army Third Platoon. [Web.] February 4, 2012. 5. Millman, Nick. 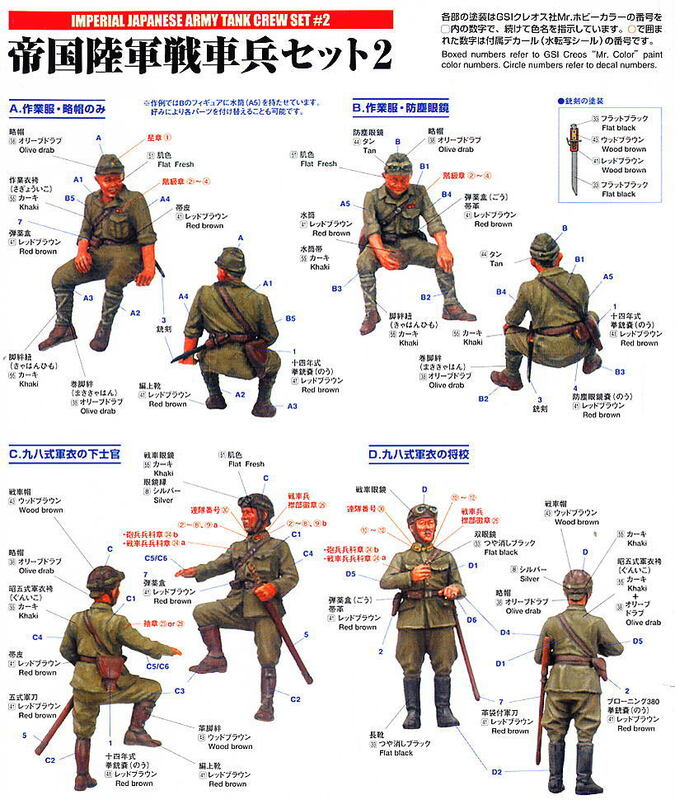 Japanese Armour Colours, A Primer, 1937-1945. January 2012. 6. Windrow, Martin. World War 2 Combat Uniforms and Insignia. Squadron Signal Publications. 1977. Highs: Impressive detail. Poses look natural and relaxed. The molded detail is very good. Lows: Mold seams to clean off. Bodies have recesses for some equipment items but not for others. Nothing except basic guidance is provided for uniform and equipment colors. Verdict: MiniArt has reinforced Japanese tank subjects with this impressive quintet of Imperial Japanese tankers. Thanks, Fred, for the fine review. Whether unique or not, IJA figures are still quite rare in styrene. Not many places carry a full line of Fine Molds, for example, and it's impossible to tell from the link whether the figures are any good or "Tamiya-quality." The point is that there are other injection-molded figures of IJA crew (Fine Molds is pretty easy to find in many online stores). These figures have been used quite extensively by IJA builders for quite some time. As for whether they're "Tamiya Quality" or not, Tamiya themselves seem to think so as they've repackaged Fine Molds' figures and tanks as their own releases. Also, here are large scale pics, which look in line with what is posted above from Mini Art (Fine Molds is premiere manufacturer and is considered a top maker of IJA and IJN equipment). Dade, I'm not sure your point about Tamiya appropriating the figures. Tamiya has re-released or licensed several kits with/from other manufacturers, but the quality of their figures is generally not up to current styrene standards from DML, MiniArt and Master Box among others. OK, we get it, these MiniArt IJA figures aren't the only styrene ones in the world. But they look a helluva lot better than anything I've ever seen from Tamiya. And the photo you posted of the built versions confirms my verdict. They look like they're at the South Pole in fleece-lined parkas, LOL. Hi Dade, Thank you for the heads-up. I knew about the Fine Molds figures and just forgot about them. I corrected my text in the review to reflect that MiniArt are not the only injection set. Bill, IMHO these figures are a step above Tamiya in detail, while a step below in molding. I have not built Tamiya figures in a very long time but I think the mold seams are no better than older Tamiya. I may have to break open a recent Tamiya figure set and compare. That said, except for "The Girls" Women of WW II Era, I can't think of any 'modern' injection figures I've built for a very long time. Bill, I actually own all of the figure sets discussed-- Mini Art and Fine Molds, so I'd like to think I know what I'm talking about. Fine Molds' stuff is pretty close to Mini Art's quality. The pics aren't perfect, but I wanted something to give a feel for how they are. As for "fleece-lined parkas", you do realize that those are the actual cold weather tanker uniforms, don't you? I'm not sure if you're trying to say these didn't exist or that they didn't look like the figures, but I can assure you, they did (please note the tanker on the right in the picture below). Remember that the IJA was also active in mainland China and Korea and it could get pretty cold there (not to mention Japan itself)! I only wanted to let builders know there are other injected-molded options out there, so I'll check out of the conversation. You may feel that my modeling skill is below-average and that I produce horrible work-- thus you feel I'm not to be believed on issues of quality. Fair enough and to each his own. Fred- no worries and I deeply apologize if I stepped on your toes. Being an IJN/ IJA builder can get pretty sparse compared to all of the usual German stuff. So always good to spread the word! Thanks for your time and take care. Dade - thank you, and you didn't step on my toes. In fact, I encourage anyone to correct any substantive errors on my part. That's a great photo of the crew standing on the PzKfw I; it almost looks like 1/35 figures on a 1/48 tank! ???? Dade, I'm not sure where you came up with that impression, but I know nothing of you, your modeling skills or your work. I meant to cast no aspersions on them in any case, and apologize if I somehow left you thinking that. I did not realize these figures were supposed to be in cold weather gear, though I still find the Tamiya figures pictured to be below the standards of current styrene technique. I am also quite aware of Japan's presence in China, as I have studied some Chinese history, speak the language somewhat, and know the lasting antipathy that many Chinese feel towards Japan because of the war. Let's let the figures speak for themselves. I'd love to have you review the Fine Molds figure sets for Armorama. PM me if that's something that would interest you. Sadly, IJA subject matters don't get the coverage here their numbers and importance to WW2 history deserve.